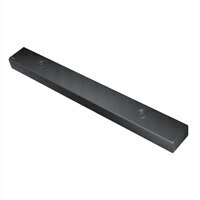 Samsung Sound+ HW-MS750 Sound Bar for Home Theater Wireless Bluetooth, Wi-FiThe Sound+ HW-MS750 offers rich, room-filling sound, with an expanded soundstage that adds depth and dimension to your favorite movies and music. With fewer wires and a single mount option, the seamless, one-piece design becomes one with your TV. Distortion canceling technology predicts and cancels out distortion before it happens. Multi-speaker control increases the power and depth of bass by precisely coordinating the movement of each speaker. The result is richer, more detailed bass. Every spot is the sweet spot. Get consistently amazing sound everywhere in the room with the amazing tweeter. Connect your soundbar to your TV with ease and without the clutter of wires via Bluetooth or Wi-Fi. You'll be able to enjoy all your content instantly with clear, impactful sound. The Sound+ HW-MS750 offers rich, room-filling sound, with an expanded soundstage that adds depth and dimension to your favorite movies and music. With fewer wires and a single mount option, the seamless, one-piece design becomes one with your TV.